This week’s monster of the week is a demon that Jude, Malcolm’s pet demon, releases that causes famine. It stares at people and makes them eat everything in sight in desperate hunger (kind of like dog owners who need to get their dinner down before succumbing to those pleading eyes) and then they die of starvation which is unpleasant. The demon is running around the vents of the Eisenhower Building. This is a whole lot of people to snack on for said demon. The beastie is killed and duly vanquished. But Malcolm was behind this and this was all part of his plan to charge up the scales of Lady Justice with hunger power. That duly stolen he presents it to his new comatose/mojo’d assistant: Helen. She will now be his horseman of Famine. Logan, the social media plague guy is the Horseman of Pestilence. They also dig up the headless horseman and plan to heal him since he was hurt over the whole Philosopher’s Stone thing. That gives them 3 of the 4 horseman. At last Ichabod and the gang catch on to what they’re doing. …and someone slap those words out of Ichabod’s mouth right now. Now he thinks he has a family, here in DC not Sleepy Hollow, where he was with Abbie? Gah gah gah no, at least mention the great big sucking void that is caused by Abbie’s loss. Especially when talking about Jenny moving into the flat down the hall for her own part of this Abbie-less family. Not over it. Will never be over it. Ever. But this is also Jenny’s storyline: because when talking to her contacts she learns that there’s demand for a shiny magical artefact and that used to be her job – going around the world, having adventures and finding shiny artefacts for dubious buyers. The life of Lara Croft is appealing to her: because it would be her thing, her life – not something she shares with the rest of the gang. Which I’m torn about. 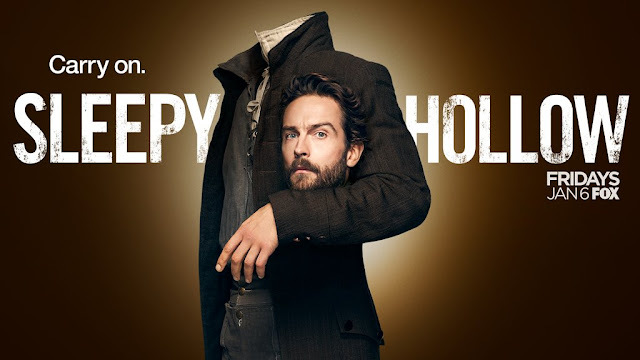 On the one side – Jenny, the only character except Ichabod who has survived the first season and a character very much in danger to becoming Ichabod’s sidekick – needs her own storylines to make sure she doesn’t become a sidekick. At the same time this sounds like an excuse to either write her out or have her disappear for several episodes as she pursues various projects. And still not over Abbie.